With more than sixty years in production, Tuflex® Recycled Rubber flooring has been proven in the industry as the best option for sports and commercial applications. With more than sixty years in production, Tuflex® Recycled Rubber flooring has been proven in the industry as the best option for sports and commercial applications. Tuflex Recycled Rubber Tile, manufactured by Roppe Corporation, is proudly manufactured in the USA using a patented process and a formula that is predominately recycled rubber. With FloorScore certification for indoor air quality and low VOC emissions, Tuflex provides a healthier environment for therapy rooms in healthcare facilities, veterinary offices, workout rooms or weight rooms in the gym as well as many other applications. With proven third-party lab results, Tuflex provides excellent sound and shock absorbency factors making Tuflex rubber flooring the ideal choice for sporting facilities, reducing the strain on joints and increasing the comfort of the user’s workouts. 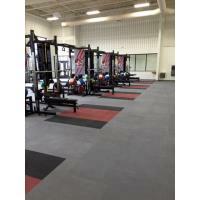 With a wide variety of color options to choose from, gyms with heavy equipment, weight rooms and locker rooms can be more aesthetically pleasing with the strong and durable flooring that is required in these facilities. Tuflex can be used in interior or exterior applications. The smooth surface is highly durable and low-maintenance, yet promises excellent slip resistance; Tuflex exceeds the level of coefficient of friction (COF) recommended by both the ADA and OSHA. For architects specifying a sound- and shock-absorbing flooring material, LEED project managers looking for the most credits possible, designers who need that unique look or a general contractor who wants an environmentally friendly, easy-to-install floor that will be available through local distribution, Tuflex Recycled Rubber Flooring will exceed your expectations. This Product Spotlight is promoted by FCICA - the Flooring Contractors Association.